Gallium-68, and indium-111 share the same group in the periodic table and can be harnessed for a range of applications in nuclear medicine, including scintigraphy, SPECT, PET and targeted radiotherapy. Indium-111 and gallium-67 are gamma-emitting radionuclides with long half-lives (67.3 h and 78.3 h, respectively), while gallium-68 is a positron-emitting radionuclide with a very short half-life (68 min). All three radiometals can be conjugated to biomolecular vectors using bifunctional chelators. Despite the chemical parallels between the three isotopes, their applications in nuclear medicine vary widely. Indium-111 is principally used in conjunction with vectors with longer in vivo pharmacokinetic profiles such as cells and monoclonal antibodies. In contrast, the use of gallium-67 has centred upon exploiting the biological behaviour of the free Ga3+ ion, specifically for the imaging of tumours and infection. 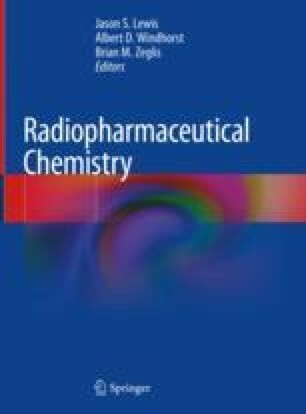 Finally, gallium-68 typically serves as a radiolabel for small molecules with rapid pharmacokinetic profiles, such as peptides. Both indium-111 and gallium-67 emit Auger electrons as well as photons, leading to their potential use for radionuclide therapy. Chelators and bifunctional chelators for gallium and indium share common features but are not interchangeable. While gallium-67 and indium-111 were foundational nuclides for the field, they currently have diminished profiles, whereas the use of gallium-68 is burgeoning. The design of chelators for gallium has advanced markedly in the last decade, stimulated by the need for chelators that can be labeled with gallium-68 quickly under mild conditions using a radiopharmaceutical “kit”.